Warning: This article contains massive spoilers for all of Destiny 2’s campaign story, right through to the very end, along with a great deal of speculation as to where things are going next. If you have not yet finished Destiny 2’s story, you might want to get out of here right now. Destiny 2 has a hell of a campaign story, with a hell of an ending. But, like all things Destiny, of course it raises questions and teases ambiguities. Having been a scholar of Destiny lore for the least three years, I noticed a whole bunch of exciting nods, set-ups, and teases over the course of the game, but they really ramp up during those last few hours. The Speaker dies, shortly after admitting that he was pretty much lying about being the voice of the Traveler all along. Gaul turns into a giant-Gaul made of Light. The Traveler nukes him and shatters itself in the process, sending Light out far beyond the solar system. A fleet of giant, very scary ships picks up the ‘signal’, light-years away. 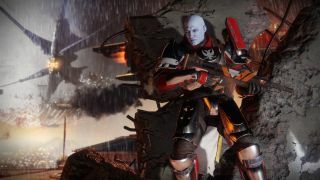 It’s a huge, scenario-shifting end, that leaves Destiny fundamentally changed as it settles into its post-campaign content. Thus, I decided to apply my knowledge to what happens, looking at what goes down throughout the campaign, how it all ends, and what Bungie looks to be setting up for the future. There’s yet more to investigate in Destiny 2’s Adventure missions, so I’ll update this article as I find new things to explore, but for now, read on, and I shall explain all - or at least theorise. What happened when the Traveler exploded? Technically, the Traveler didn’t explode. It’s an oft-overlooked bit of Destiny lore than the giant magic space golfball isn’t actually the Traveler itself, but rather a physical representation of it. A kind of proxy, that may or may not contain something else. But regardless, yes, that Traveler did let out a huge, extra-galactic burst of Light, which seemed to tear its own shell clean open. Why go so big? Probably the combined necessity of killing the giant, ethereal, giga-Gaul and reconnecting every Guardian on the planet (and off-world) with the Light. Is the Speaker really dead? I think he has to be. The symbolism of his fallen and crushed mask is too great for this to be a fake-out, and having finally revealed The Big Lie many have long suspected, there’s no way he could continue to be part of the main story. His role in Destiny was to keep the big secret, and now that he has let it out, there’s no further function for him. I’m calling this prime evidence that there will not be another Speaker. Ghost’s question is a surely cue that things are going to change. And with the Traveler literally blown wide open and the Speaker proved a fake, that leaves a lot of scope for the continuing story to take us somewhere very different. Who the hell was in that fleet of giant spaceships? Basically, we don’t yet know, but they’re almost certainly bad. They’re also very probably a brand new villainous species on the way to kick our arses in future Destiny 2 DLC. The case for their newcomer status is made by their tech and location: we’ve never seen any technology that looks even remotely like those ships before, and the fleet, when the Traveler’s Light finds it, is resting far, far outside our galaxy. The Destiny story so far has never even travelled beyond our solar system. What were those Hive and Taken Rituals about? The Hive and the Taken, while both still active throughout the end of the first game’s story, have been rather directionless. Two very connected enemy factions, both were under command of Hive god-king Oryx, and he was very much in league with the Darkness, to the degree of pretty much being its physical manifestation. The Hive and Taken’s power came directly from his union with it. But we killed Oryx at the end of the Taken King expansion. According to Hive hierarchy rules, technically we should have taken his throne upon destroying him, but we didn’t. Throughout Destiny 2’s campaign, we see summoning rituals being carried out by both the Hive on Titan and the Taken on Io, strongly indicating that both are very much making a play for resurgent power, attempting to drawn through - or at least communicate with - a new leader. During several of the story and Adventure missions on Io, we encounter mini-bosses with names related to someone called Savathun. One of them is even denoted as their Herald. It seems that Savathun is vying to break through to the physical realm, which would explain the Hive and Taken rituals. As for Savathun’s identity? She’s one of Oryx’s two sisters. She bonded with the Darkness at the same time as her two siblings, millennia ago. She’s existed outside of the main story so far, but is known to still be active in the Hive’s supernatural Ascendant Realm. With the Taken/Hive Throne open for the taking, it seems that she (always known as the cunning one of the three) is making a move to claim it. What was going on in the Voidwalker subclass mission? During the Warlock mission to reclaim the Voidwalker subclass abilities, we get a huge dump of lore. A male voice we haven’t heard before recounts a rather extreme account of Warlock philosophy and doctrine, discussing the need to brave the Void, and explaining that a good Voidwalker will be compared (by small minds) to the mad evil of a Hive Wizard. The voice expresses a desire to appear in the Tower and “taunt them”. It claims to dance in light and shadow, never sleep, enjoy immortality, and questions the purpose of Vanguard law if it led the Tower to its current state of defeat. It states that it shall enter deep places and call out for Osiris. All of this is very important. That voice right there is very probably Toland the Shattered, a long-lost Warlock who was deemed mad for his progressive views on the Hive, and the true nature of Light and the Darkness. He refused to be shackled by the Speaker’s simplistic ‘Light good, Dark bad’ mantra, and sought to discover more about the empowering nature of both forces. He was eventually lost in the Hive underworld, presumed dead, but has survived in some ethereal form in the Hive Ascendant Realm. And Osiris? A very similar Warlock, only his chosen subject of Light/Dark crossover was the Vex, and their space-time travel technology. Also affiliated with the shadow-happy Awoken and the Nine (see my dedicated Xur/Nine/Osiris article here for more details), Osiris was once the Speaker’s apprentice, until he was exiled for refusing to toe the official line, wanting to understand the deeper truth behind the Vanguard view in order to ascend to a higher level. Currently deemed both alive and dead, Osiris is believed to exist in the Vex’ space-time network (or some self-created semblance of the same), possibly across multiple universes. I’ve long posited that if the Tower was going to fall despite the Speaker’s belief in his dogma, and if the Speaker was going to truly die in Destiny 2 (which he has), then that leaves the door wide open for Osiris (and possibly Toland) to come back and change the Vanguard outlook. Destiny 2’s first expansion is called Curse of Osiris, and the new Trials PvP mode is called Trials of the Nine. It sounds like all of these guys are going to hit the new Tower soon, and the Voidwalker subclass mission feels like a huge hint of things to come. What’s happening with Rasputin on Io? In order to gain more information on Gaul’s superweapon, Ikora Rey connects Rasputin to Io’s mainframe. Rasputin is the Earth node of the interplanetary Warmind defence network, and we reconnected him to the inner solar system in an early mission in the first game. Now though, he has full access to the Jovians, and that matters. Because the Nine live in the Jovians. And the Nine notoriously dislike intrusion. A couple of meditating Guardians and some random Vex and Fallen they can probably handle, but a hyper-intelligent, weaponised AI, now free-wheeling off on its own (very mysterious) agenda? That feels like a clash in the waiting. And did I mention that Destiny 2’s second expansion is about Rasputin? Ikora’s hardware bodging could be the start of the whole next wave of Destiny story. Who were the crew of the Exodus Black, and how long ago did the ship crash on Nessus? We can work out some interesting stuff by, er, working this one out. You see (at least) three Exodus ships attempted launch from the Cosmodrome in Earth’s distant past. Exodus Blue never made it off the planet, and now rots as part of a Crucible map in the first game. Exodus Red, we know only from a Grimoire card, in which its AI expresses it unlikely that that ship will make take-off either. Both ships were refugee craft, filled with would-be escapees from the Collapse, on the day that the Darkness hit Earth. So it’s highly probable that Exodus Black was part of the same initiative. As well as the naming similarity, we know that Exodus Black was carrying the Golden Age nanotechnology SIVA, in order to help the crew colonise a new world, and SIVA use has been locked down, due to being dangerous as hell, since Earth fell. It must have launched during the Golden Age, and given the naming convention it seems likely that happened during the Golden Age’s last days. All of this (sort of) helps us date the Collapse. Nessus, you see, is on a visiting orbit, and only enters our solar system every 122 years. There are Tower records going back that far, so at the minimum we’re looking at the Collapse happening 244 years ago. Or 366, etc.